Treat yourself to a special day with your family and friends! A major advantage of these day tours is that you can relax and enjoy! You do not need to worry about reservations, taking a wrong turn, parking, or finding the right local transportation. All entrances are included! And make the most of the day with our local expert guide showing not only the major sights but also giving you lots of background information and sharing tales and stories with you! We're very flexible! We'll be happy to change features to make the day perfect for you! Just ask! Larger groups welcome and possible on request. Assistance in arranging accommodations and transfers is available. You can click or tap on any title in the boxed list below to go directly to its details. Itineraries for these tours are provided below the list, followed by a map of tour destinations and a note about references. Prices and reservation tools are at the bottom of this page. 500 Years of Mining "White Gold"
You are picked up at your Munich hotel, and we go south to the Bavarian Alps to the village of Hohenschwangau. 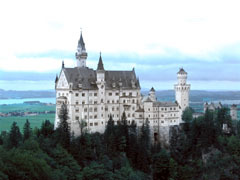 Visit King Ludwig II's Neuschwanstein Castle for an inside guided tour with a local castle guide. From there continue to Oberammergau, the beautiful Passion Play village below the mountains that's known for its house frescos (Lueftl painting), woodcarvers, and Christmas shops. You have free time to have a bite to eat, to explore on your own, and to shop for great souvenirs. Our next stop is Linderhof, built between 1870 and 1879, in an elaborate rococo style recalling the Bourbon Kings and where Ludwig actually lived for several years. 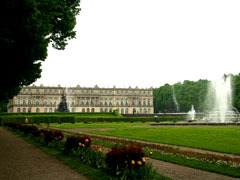 We tour inside the palace with a local castle guide, and your have time to go for a stroll in the formal gardens. You are returned to your Munich hotel or pickup point. 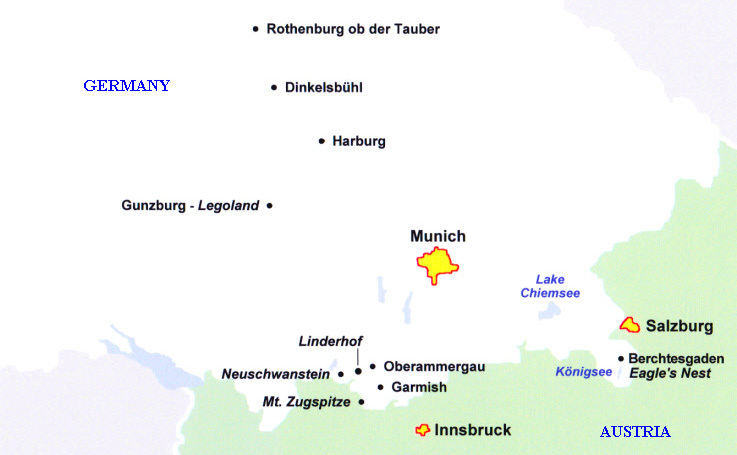 You are picked up at your Munich hotel, and we drive east to Lake Chiemsee, Bavaria's biggest lake. In Prien, board a boat to go to Herrenchiemsee Island to see King Ludwig II's largest castle,Herrenchiemsee, which he built after a visit to Versailles, and where he stayed only one week. Inside guided tour of the New Palace and entrance to Ludwig Museum and the Old Palace. After free time for lunch, travel by boat to the island of Fraueninsel. This is one of the most beautiful places in Bavaria, and boasts an ancient monastery at the centre of the island. You will have time to visit the Benedictine monastery, and to stroll at leisure around the island. Return by boat again to Prien, and travel back to your Munich hotel or pickup point. You are picked up at your Munich hotel, and we drive east along the Bavarian Alps to the baroque city of Salzburg, this world famous city of Mozart and Sound of Music, so rich in history, culture and tradition. 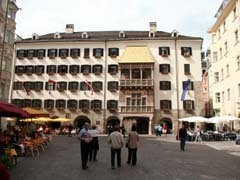 Upon arrival join your guide for a walk through the old town, since 1996 on the UNESCO World Heritage List. 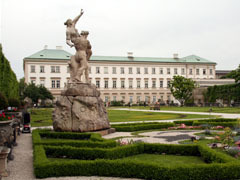 See the Mirabell Gardens – one of the settings for The Sound of Music, Getreidegasse with Mozart’s Birthplace, and the Cathedral. Enjoy plenty of free time afterwards for shopping, sightseeing, maybe take the funicular up to Fortress Hohensalzburg for fabulous views, or spend time in one of the traditional Kaffeehaus and try the famous Salzburger Nockerln. 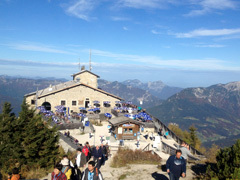 You are picked up at your Munich hotel and go East along the beautiful Bavarian Alps to the Eagle's Nest (Kehlsteinhaus in German), a relic of a regime long gone but never forgotten, and a curious step back in time. A symbol of the power of the National Socialism regime, the Eagle’s Nest was presented to Adolf Hitler on his 50th birthday. It remained unharmed during the war and is now preserved in its original state. Since 1960 all admission revenue goes to charity. The Eagles Nest can only be reached by a local bus ride followed by a trip through solid rock some 400 feet to the top of the mountain in a luxurious brass elevator. 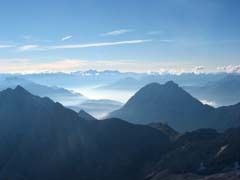 The view from the top shows the breathtaking scenery of the Bavarian and Austrian mountains. Afterwards visit charming Berchtesgaden before returning to your Munich hotel. You are picked up at your Munich hotel, and go northwest to medieval Rothenburg ob der Tauber in Frankonia where you feel like you just jumped back into the 16th century. 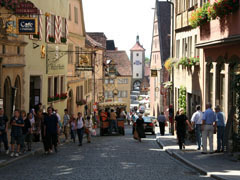 Completely surrounded by its medieval ramparts with countless towers, Rothenburg is famous for its ancient houses, fountains, cobbled lanes, hidden corners and street signs. 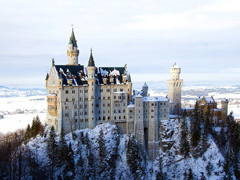 Also famous for the Meistertrunk, in which – according to legend – the burgomeister saved the town by emptying a 6-pint tankard in one single draught. Time for lunch and stroll through Christmas stores before we take the Romantic Road to Dinkelsbühl where you can admire another fully fortified town. 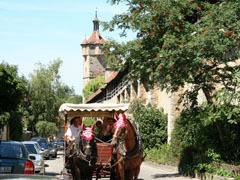 Continue on the Romantic Road to Harburg Castle where you will get a tour through the 900 year old medieval castle. Return to your Munich hotel or pickup point. You are picked up at your Munich hotel, and go south to Bavaria to Garmisch where we take a cable car up to the Zugspitze, at almost 10,000 feet Germany's highest mountain, with a matchless panorama. Time for hot chocolate, mailing postcards from the top of Germany, a snowball fight and border crossing on foot! Return to Garmisch, host of the 1936 Winter Olympics and Germany's No. 1 winter sport resort, with a beautiful historic centre. Take the time to walk down any street and you will be amazed at the paintings on the outside of the homes. The Bavarians have a long history of decorating the exteriors of their houses and businesses with both religious and historic paintings. The structure of the homes are also amazing. In spring and summer you can enjoy beautiful flowers trellising down off the picturesque balconies. Free time to enjoy, before we are heading north again, with another stop in Ettal where you have time to visit the Basilica, which was founded by Emperor Ludwig the Bavarian in 1330, and became one of the most important Benedictine Monasteries of the Alpine region. Try the well known Ettal beer, cheese or liquor before we are head back to your Munich hotel. You are picked up at your Munich hotel and drive east along the Bavarian Alps to visit the Salt Mine Berchtesgaden, which has been in operation since 1517 and is one of the oldest working salt mines in the world. A visit to the mine is a great opportunity to learn about the economic and political history of “White Gold”, as salt used to be called. You will also learn about how salt is mined and transported, and about its many uses, from culinary to medicinal. 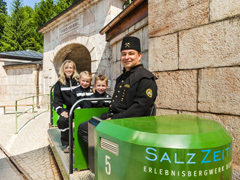 The guided tour of the mine includes dressing up in protective miner clothing, a train ride into the heart of the mountain and a short fun slide to a sparkling underground lake. This is a wonderful adventure that can be enjoyed by people of all ages. Afterwards enjoy more of this charming region. Spend time in charming Berchtesgaden and make a photo stop on Königsee before we travel back to your Munich hotel. You are picked up at your Munich hotel and drive south through the Bavarian Alps into the Tyrolean Alps down to the Inn Valley to the Tyrolean Capital, Innsbruck. Go for a walk with you guide and explore this most charming city, see the famous little Golden Roof in front of the mountains, the beautiful baroque Cathedral, visit the Hofburg, Empress Maria Theresa's summer palace and enjoy some leisure time – great shopping everywhere or have a Sachertorte in the famous Sacher Café. Continue on a short ride to Swarovski Crystal World (Kristallwelten) in Wattens, a true feast for the eyes and all senses. Travel back to your Munich hotel. You are picked up at your Munich hotel and taken to Legoland Deutschland at Gunzburg, a fantastic world created using over 50 million LEGO bricks. With countless attractions and spectacular shows, a special adventure awaits everyone here! The IMAGINATION area is for those fascinated by research and experimentation. ADVENTURE LAND is hidden in the middle of a LEGO brick jungle. A suspension bridge takes you inside a giant castle in KNIGHTS' KINGDOM, the realm for all budding knights and damsels. 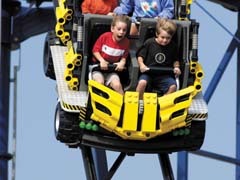 Racing drivers, pilots, helmsmen and pirates are in their element in LEGO X-TREME, TEST TRACK, LEGO CITY and PIRATE LAND. A perfect adventure for the whole family! We have been pleasing guests with our tours for years, and have an extensive set of references which you can review on our References page. Prices are per person, in Euros, for private tours. Minimum private tour size is 2 adults. Prices are shown for groups of up to 7 persons. Larger groups are welcome and possible on request. One child up to 13 years old free per adult passenger, maximum 3 free children. Older children up to 16 pay 50 %. Per person prices vary depending on the group size.